What if the canvas was blank? In preparation for my upcoming show and Open Studios, I’ve spent the better part of the spring in my basement printing and thinking. My latest linocut, Evanescence, considers a land form that is both beautiful and under threat — the river delta. 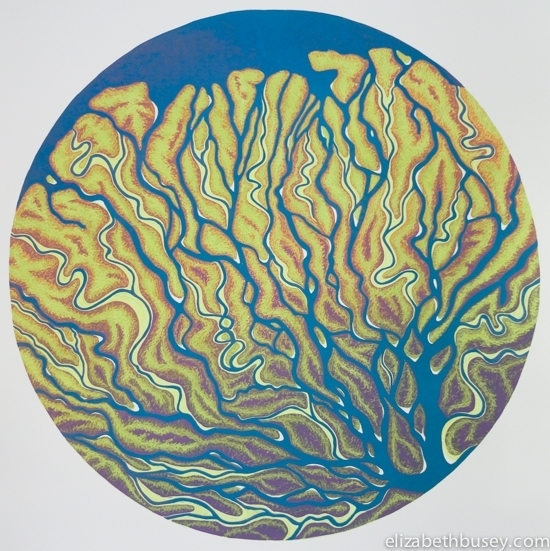 Elizabeth Busey, Evanescence, Reduction Linocut, Edition of 10, 28in diameter, $550 unframed. River deltas are wetlands that carry and deposit sediment into a particular mostly triangular shape. Like other wetlands, they are very important to both people and wildlife. River deltas provide protection from storms, filter run-off, and contain food and other resources. River deltas don’t just happen anywhere. Strong tides or wave actions from the body of water that they meet prevent many from forming. Many river deltas are sinking because of human activity. Dams and other water control measures change the delicate balance between sediment and water flow. Removal of deltas’ water, oil and natural gas resources are causing their elevations to change. Imagine if these lacy fans vanished into the oceans — leaving places like Bangladesh, Louisiana and the Pearl River in China vulnerable. An estimated 500 million people live on river deltas. It is a puzzle to me how visual artists can illustrate the lack of something. White canvases a la Robert Rauschenberg? What is the visual equivalent of Rachel Carson’s Silent Spring? Questions like these were on my mind as I spent an afternoon recently at the Indianapolis Museum of Art. On the top floor I came across a mixed media installation by Mark Dion and his studio team. 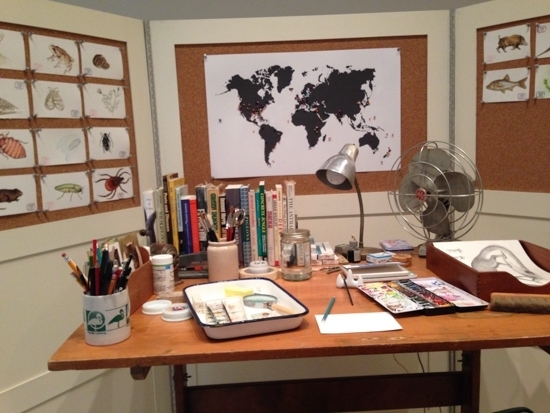 Harbingers of the Fifth Season is comprised of an artist/naturalist’s desk complete with materials. Detailed watercolors on cork board illustrate the many invasive species that have been introduced to new habitats and subsequently damaged existing ecosystems. 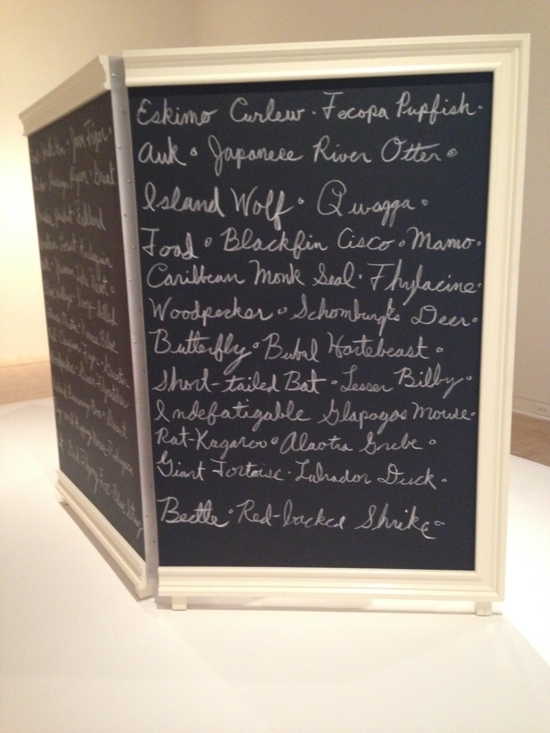 On the reverse, three chalkboards chronicle the ever-growing list of extinct species. Mark Dion, Harbingers of the Fifth Season, Mixed Media Installation, 2014. Invasive species are chronicled in naturalist’s watercolor sketches. Reverse of Mark Dion’s Harbingers of the Fifth Season, 2014. Extinct species are handwritten on three large chalkboards. The installation is calm and quiet, belying the real pressure that invasive species are placing on ecosystems around the world. How much can one artist’s work do, sequestered on the top floor of a medium-sized city’s art museum? Time to reread Silent Spring and try to discover Rachel Carson’s secret. work, enjoy refreshments and try your hand at printing. BloomingtonOpenStudiosTour.com to plan your entire tour. 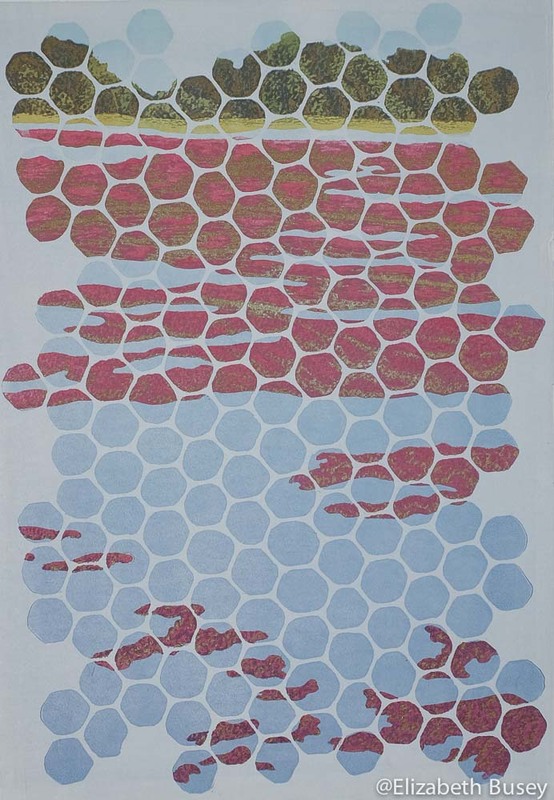 This entry was posted in Inspiration, Topography and tagged dams, evanesence, fan, Harbingers of the Fifth Season, Indianapolis Museum of Art, Linocut, Mark Dion, natural gas, printmaking, Rachel Carson, reduction linocut, river delta, sediment, Silent Spring, sinking on May 28, 2015 by Elizabeth Busey.